Donations payees: giro account "Harmonics Life Center"
Note correspondence column, "Dr. Busby Support Fund" and please specify. Currently (November 18) to the total donations is $ 776,500. Everyone, thank you. 7 Continued: I've been doing budget cuts began working as an employee of such order the manufacturer Yappa expenses. I'm hard work from many people not accustomed to it. Toka gotta hurt ... I hope. 6 continued: That's after installing ancillary facilities are laundry Toka Toka solidification facility. 'm Working around a cousin of the head plate of the contents can not work there ... but bottom line. As another reason for the increase, the fewer workers a company or cooperative affiliates have started doing it TEPCO TEPCO employees and was doing the work so far by the manufacturer. 5 more: the work has now been decided not to do debris removal flow of System Operation No. 3, dismantled equipment, dismantled unloading fuel in the SFP front of Unit 4 System Operation, Maintenance Tank maintenance of water treatment systems installed pollution, one maintenance of irrigation system maintenance in the furnace of Unit-4, I just installed or impervious wall. Four following: Unit 3 reactor building is to put a high dose Dashimashi building ... even still. I have every single 決Menakya to analyze the data in the containment gas management system.行Kenakya not work well in the reactor building or underground. This means that I do not think I should also lead to the workers. Three more: and say What do not determined why the next step is understanding the situation in the pressure vessel Toka containment do how to work them in the main those measures for waterproofing and know where I leak polluted water in irrigation in the furnace I think that I'm not embody. 2 more: I finished up the second step the government says, then the work of one of the reasons I think I also decided not to work more specifically decided not to include specific planning stage yet. One more: I was also cut workers in the National Assembly yesterday, yes, and how do I not where Japanese and Chinese companies, I do not not reduce overall workers. The reason I think fewer workers but simply not there was shrunk to the budget. A doctor from a Fukushima hospital speaking here last weekend said that many families are divided since one parent stays in the prefecture in order to work, while the other moves away with the children. He says that the divorce rate has been skyrocketing. @bo I noticed something while digging on Chernobyl information last week. I think it just finally dawned on me, how rural areas seem to play into these accidents or disasters. The nature of nuclear installations or power plants causes them to need to be put away from population centers. It seems to then have the double issue of exploiting the local rural population. Then the typical issues of rural communities come into play. Income, social status, education of the population and the small total numbers of people that all play into them being bullied, manipulated or exploited. Someone protesting at METI mentioned how the rural nature of Fukushima adds to the income disparity and how it is another situation of those with wealth running over everyone else. The twitter explanation says that Fukushima rice is going into convenience store food products. County on June 21, announced inspection of radioactive material captured wild animals. Radioactive cesium has been detected in 4600 to 10,000 becquerels of wild boar meat was captured in Nihonmatsu. Of the test, eight samples from wild boar and Minamisoma city, the country's interim standard all samples (500 becquerel per kilogram) exceeded. 4600 Becquerel discovered ten thousand range 693-1. Been captured in the wild boar Minamisoma was first detected. 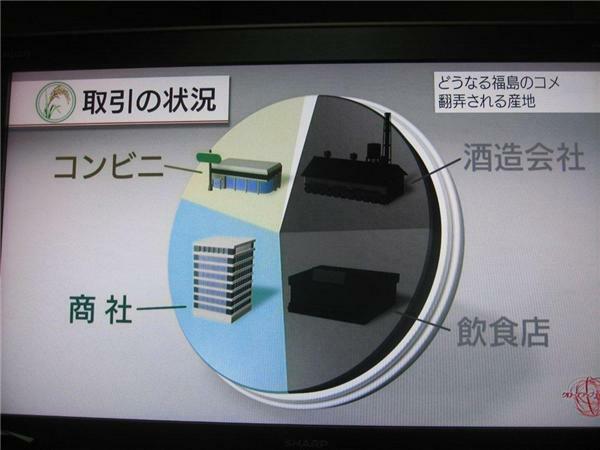 Aizu boar, in all regions except Minamiaizu detect radioactive cesium exceeding the provisional standard in the country. Refrain from self-consumption is in the region, bi-phase uptake in the region, where the ship is limited. More Deaths at Fukushima Than Chernobyl? Fukushima Food Safe To Eat?